The Snails' New EP "The River" Available for Pre-Order! "The River" is being released on July 31, 2012 and if their smokin' debut, From Kingston to Memphis, is any indication, this EP should not be missed! 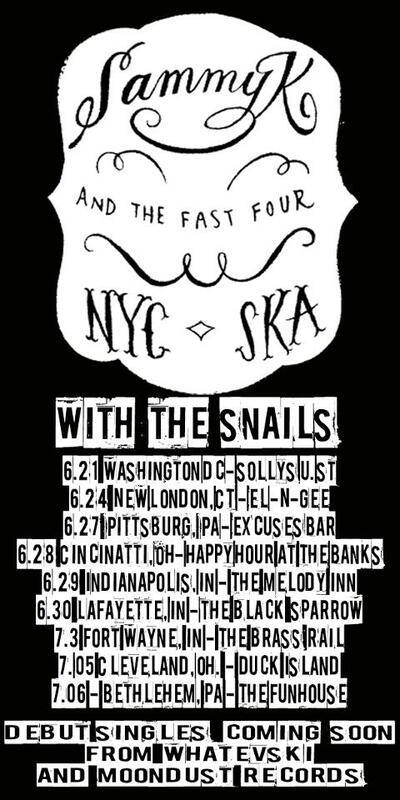 The Snails are currently on a tour of the Midwest with Sammy K and The Fast Four. 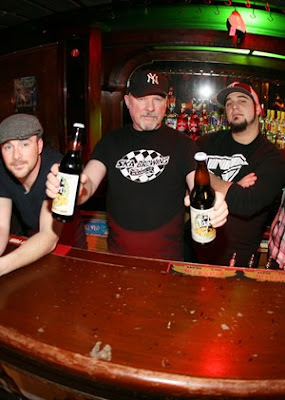 The BBC website has a short segment on the Los Angeles Latin Ska scene, which features a few bands on the ska-punk tip: Chencha Berrinches, Los Chiles Verdes, and Operation No-One Knows. While I didn't expect this to be a comprehensive look at the scene, I was a bit disappointed not to see more traditional/vintage ska bands like The Delirians, Los Bullets, and The Allentons (you know, acts associated with the Steady Beat Recordings and Moondust Records labels) in the mix. The video is worth a look, though. Skatalites Storm the Northeast this June! 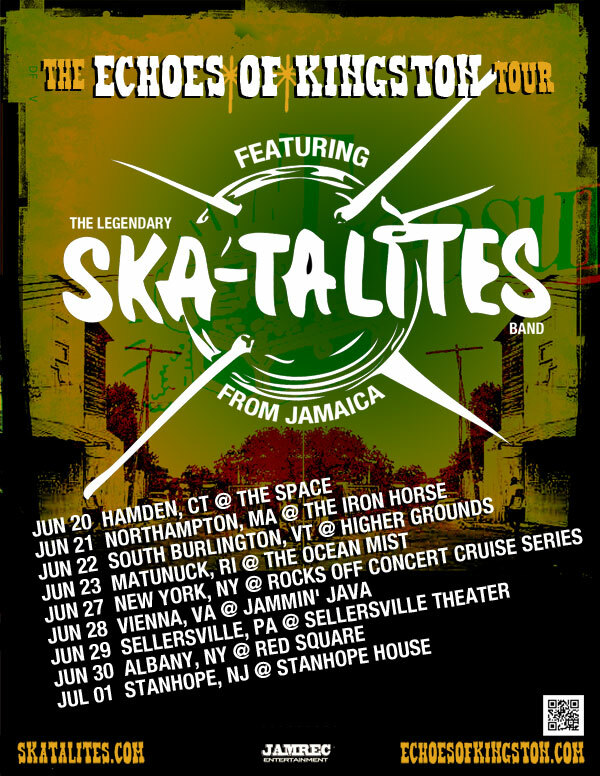 New Yorkers: check out the booze cruise with The Skatalites on June 27! Chill to the Skatalites' musical vibes on the East River and New York Bay! 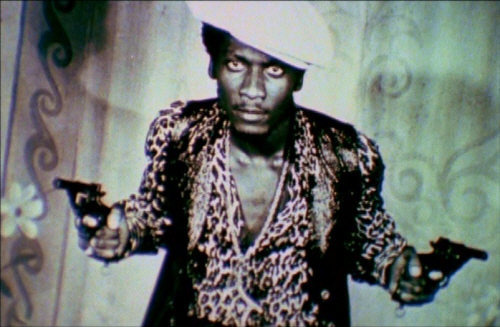 Destroy Babylon plays all night! Sammy K and The Fast Four with The Snails Hit Middle America! 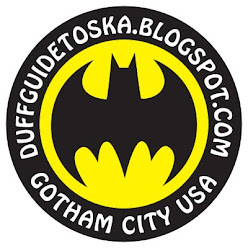 ...and Middle America will never be the same! 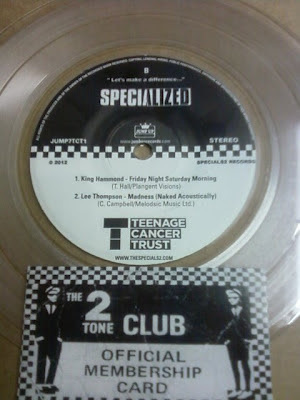 We ska types can sometimes be a little parochial in our tastes and overly protective of our minuscule slice of the music world (it's the by-product of loving an often-maligned and ridiculed subcultural music form: they don't like/respect us, so we'll reject everything outside of our little realm). Plus, we can be overly obsessed with authenticity (but that plagues any non-mainstream band and its fans now, doesn't it?). I've always had an aversion to/suspicion of any scene that is focused on excluding that which doesn't conform to an unyielding set of requirements, so I'm pretty much open to any non-ska/reggae act that decides to venture into these genres as long as they do it well (see one of my older posts related to this topic, as well as this other one, and that one, too). Reasonable enough, isn't it? My attitude, no doubt, comes from growing up during the incredible New Wave era that encompassed such an extraordinary amount of musical ground (essentially any underground, non-mainstream music from power pop to synthpop to post-punk to hip-hop to ska and reggae and much further afield) and being lucky enough to live within the broadcast area of a couple of left-of-the-dial radio stations and a hard-to-tune-in music video channel (here's to you WLIR and UHF-based U-86!). Why can't I keep you for myself?" My good friend Ned turned me on to this boss track, knowing my love of things Jamaican and I've picked up the 12" single to play if/when I ever DJ again. Little did I know that there's a big buzz about the band here and in the UK--and that they were one of the "must see" bands at this year's SXSW festival. 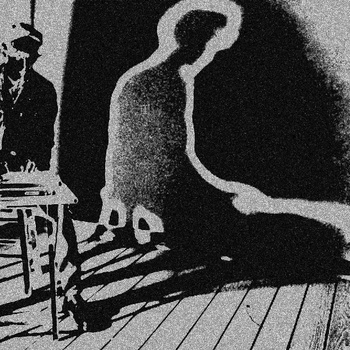 But all you really need to be aware of is that this haunting and catchy track is an all-out winner. While Wild Belle's "Keep You" follows more of a pop song structure, LeaLea Jones's dubby take on reggae in "The Road" (stream it here) is a looser, almost free-form jazz approach to the genre (check out her unusual vocal phrasing in the beginning, and while you're at it, recognize her wonderfully expressive, pure, and powerful voice). There's not a well-defined verse/chorus structure and the song goes through several shifts in melody and rhythm. All of this lends an appropriate tension to the song (there's no musical release, really), which is about a relationship at the crossroads: do they go forward or do they go their separate ways? No, we won't go down that road"
Don't let it go, no"
This "Road" is a bit more challenging at first, as it doesn't have the immediate hooks to seduce your ear, but the song definitely works its way into your head after just a few listens. And even though the couple's conflict is unresolved at the end of the song, there will be no doubt that this is an extraordinary track from a gifted performer. The Specialized EP kicks off with a fantastic cover of Andy & Joey's "You're Wondering Now" by The Values featuring Roland Gift (I can't tell you how good it is to hear his voice again after all these years--he's been sorely missed on the music scene!) Roland's mournful tenor (one of the wonderful things about his unique voice is that it sounds like he's singing using whatever the vocal equivalent of a horn mute would be) is the perfect counterpoint to the band's upbeat interpretation of this track (which, for The Specials, was their parting shot on their first album at Margaret Thatcher, the National Front, and all the other haters of a socially/economically just and multicultural society: "You're wondering how you will pay for the way you did behave..."). The Jerry Dammers/Lynval Golding anti-racist/anti-violence song "Doesn't Make it Alright" (one of my faves) receives a spirited and muscular reading from Orange Street (best lyric: "Some people think they're really clever/To smash your head against the wall/They they say, 'you got it my way'/They really think they know it all"). Good stuff. Up to the edge of the dance floor"
and get on the dance floor"
But what's great is that the singer's lament, whether from the vantage point of someone in their early twenties or just hitting the half century mark, is that the night oftentimes ends the same: "Wish I had lipstick on my shirt/Instead of piss stains on my shoes..."
Madness' Lee Thompson cheats a bit by opting for Prince Buster's classic tune "Madness" (of course, what else could he do?). But instead of the expected rollicking music hall stomper, this is the "Naked Acoustically" version--really a lounge lizard/dubby take on the song, with Lee half singing/speaking the vocals with percussion, a bit of piano/organ, and sax. The setting could be a rundown nightclub at closing time or the rubber room at an insane asylum, but either way it works! This morning, I caught the tail-end of Scott Simon's "Weekend Edition" interview with Pauline Black on NPR regarding her autobiography "Black by Design," which has just been published in the United States (you can hear the entire NPR interview here). "I know [this] probably sounds a little bit like a cliche, but I feel that it's very, very important for every individual on this planet to know where they came from and who they came from," she says. "It just gives you a sense of belonging, and I think that sense of belonging is more profound than probably any of us give it credit for." 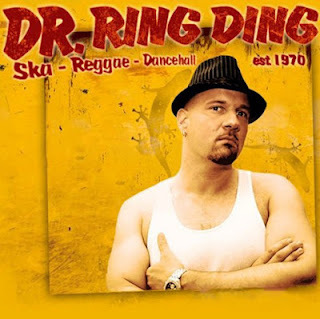 The Return of Dr. Ring Ding! The recordings for a new, all-ska album of Dr. Ring Ding have started! It will be accomplished in Catalonia and Germany, comprising, among others, members of Barcelona’s own Freedom Street Band, as well as some of the Doctor’s longtime companions from the German ska and reggae scenes, and a few special guests from Jamaica and the USA. New compositions of old school ska in the vein of the legendary "Dandimite" release from 1995 – we will keep you updated! The aforementioned Dandimite release (with the Senior Allstars) was definitely one of the best traditional ska releases of the 90s, and its follow-up, Ram Di Dance was in every way its equal (the more musically adventurous should track down Diggin' Up Dirt, which mixed hip-hop and reggae with incredible results--while a good compilation of Dr. Ring Ding's output from the 90s-00s can be found on Back & Forth). Most of the good Doctor's work lately has been in the realm of dancehall (apparently there is a fairly huge German dancehall scene), but it's really welcome news that he's back on the ska tip again.